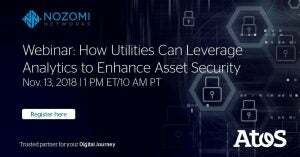 Nozomi Networks in conjunction with partner Atos, and Electric Light & Power, hosted the webcast: How Utilities can Leverage Analytics to Enhance Asset Security. Guests joined us to learn how machine learning, AI and data analytics could be used to monitor and maintain the security of their power assets. Nozomi Networks Director of Product Research & Strategy Paul Smith, and Atos CTO, Telecom, Media & Utilities Mazi Fayazfar also explained how to leverage data from digital and analog sources to extend asset lifecycles, and system reliability and safety.